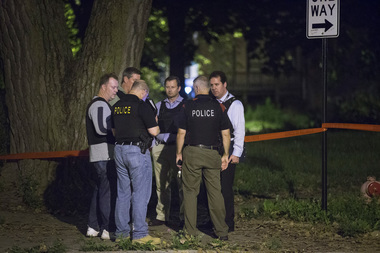 CHICAGO — Let’s be honest, not many people had read the Chicago Police union contract before video of the fatal shooting of Laquan McDonald was released and the U.S. Justice Department launched an investigation into dirty dealings at the Police Department. As things turned out, the Fraternal Order of Police Lodge 7 contract is filled with fascinating tidbits that shed light on what it’s like to be a big-city cop — especially when an officer faces misconduct allegations or has fired a gun on duty. • Must make a first statement to their supervisor in secret. • Cannot be publicly identified. • Receive provided written copies of all their statements. • Allowed to interrupt interrogation sessions, which must be a "reasonable" amount of time, for "personal necessities, meals, telephone calls and rest." • May be allowed to review, when permitted by the city, any video or audio evidence before being interviewed by IPRA investigators. • Can revise statements without punishment after seeing video or other evidence from the shooting. • Will not be charged with violating Rule 14 (making false statements, written or oral) if they are not allowed to review video or other evidence before being interviewed by IPRA. • Can decline to take a lie-detector test. • Shall not be made available to be interviewed by reporters unless the officer is criminally convicted or discipline is finalized by the Chicago Police Board or police superintendent. • Shall be informed of the identity of the two officers (and just two) assigned to conduct the misconduct interrogation. 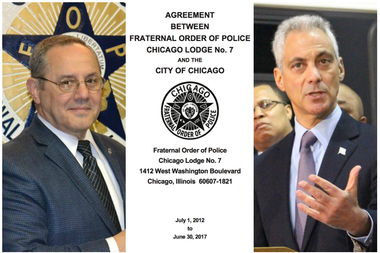 Fraternal Order of Police President Dean Angelo Sr. (l) and Mayor Rahm Emanuel. Keep reading the 178-page document and you’ll find even more intriguing details. For instance, the contract also allows officers who face up to three days' suspension to forfeit accumulated vacation, personal days, and even “baby furlough days” rather than being removed from actually serving a suspension. Also, officers disciplined for misconduct who appeal their punishment to an arbitrator are not required to serve suspensions — and remain on paid status — until an arbitrator (or the Police Board in officer termination cases) makes a ruling on the merits of punishment. And when it comes to police officer pay, there are plenty of ways officers make an extra buck for doing things like being available for duty (even if they don't show up), speaking Spanish, wearing uniforms and going to court. • At least two hours of overtime pay to attend required court sessions when not on duty. • Time-and-a-half pay for serving as a language translator outside their assigned unit, plus a two-hour overtime pay bonus if work is done not during regularly assigned duties. • No limit on the amount of compensation time due an officer can accumulate. While Mayor Rahm Emanuel has made it clear that he plans to ask the police union to renegotiate some terms of the contract related to police misconduct investigations and discipline, police union officials have said they’re not interested in revisiting the deal that expires in 2017.